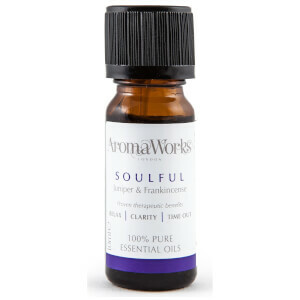 Discover tranquillity with the Soulful Essential Oil from AromaWorks. The Organic Essential Oil can be massaged into the skin, or burned in order to fill the home with calmness. The formula’s aroma is a warm blend of Frankincense, Juniper Berry and Patchouli, popular for relaxation and easing away fatigue. To Massage: Apply a few drops to the palms of the hands and gently massage onto the skin. To Burn: Sprinkle up to 5 drops of essential oils onto the diffuser and the water will gradually evaporate, filling the room with the aroma. Juniper Berry, Frankincense, Bergamot, Patchouli.